Jared Unzipped: Real Acts Of Charity You Can Do Right Now In Your Community. Real Acts Of Charity You Can Do Right Now In Your Community. 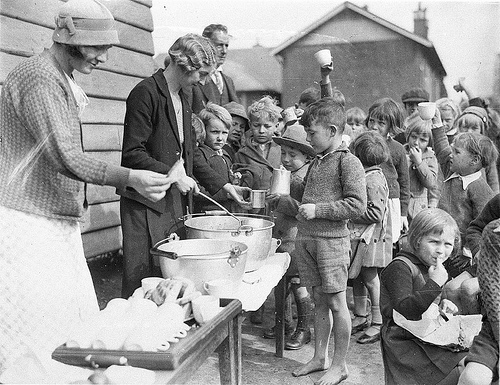 A soup kitchen for children during the Great Depression of the 1930's. Everywhere you turn, there are various charities asking for your money and resources. From bell-ringers to food pantries, it seems so many groups are asking for assistance. Personally, I tend to shy away from donating to large, corporate-run charitable groups. More often than not, they fail to be as charitable as they claim. Instead, you're funding a massive, out-of-touch organization that ultimately exists just to make a profit and pay their executives an exorbitant salary. Even worse, you may be supporting a group that serves to spread a disingenuous religious agenda. One must look no further than the United Way, American Red Cross or Salvation Army for such questionable groups. If you really want to make an impact this holiday season, consider being charitable within your own community. The things you do locally can make a positive difference on your neighbors, which ultimately will improve your life as well. Here are five ideas to get you started. Better yet... none of these ideas will cost you anything but your time. Volunteer at your local animal shelter. As ironic as it may be, the holiday season is usually the worst time of year for pets being surrendered to local animal shelters and humane societies. Perhaps it's because people simply can't afford to care for their furry family members and pay for gifts. Though, the more insidious and realistic reason is that folks turn in their old pets because they receive new ones. This notion is so disgusting that it makes my skin crawl. Humane societies and animal shelters all across America see a spike in surrendered animals during the holidays and they need our help. Visit with your local animal shelter and offer your time. Animals are innocent beings which deserve people whom care about them, no matter what. This idea rolls directly into my next tip. Don't give pets as gifts. The worst thing you can do is give someone an animal during the holidays. Living creatures are not gifts. They need the proper amount of love, care and attention; many people can not properly provide for a pet. Even worse, many treat pets like automobiles -- they're constantly trading them in for something new or different. If you want to be charitable, help to not exacerbate the overpopulation of dogs and cats in this country. Organize a trash pick-up. Whether alone or with a group of friends and family, agree to clean up a park or street that's often neglected. Our public lands are a mutual interest that we all hold an investment in. So many of our fellow citizens throw their trash out of their vehicles while traveling down the highway. I realize that it's not your responsibility to clean up after another person, but do it anyway. Read to children. Let's face it... kids aren't getting any smarter. In this modern age of smart phones and tablets, children simply aren't reading as much as they used to. As a direct result, they're forgoing so much of what makes humanity special and losing a degree of creativity in the process. Offer to spend time in your local elementary school or public library. Share a classic novel with kids and inspire them. Enrich their sense of wonder and encourage a lifelong love affair with books. Volunteer at your local senior citizen center or nursing home. The holidays can be a lonely experience for senior citizens. I speak from personal experience on this matter. When I was younger, I worked with an ambulance company. We often would visit nursing homes and assisted living facilities for emergency calls. Many residents would have little contact with their family, nor would they have any friends to speak of. This was a year-round dilemma for these senior citizens, with the holiday season becoming an exercise in loneliness and depression. Volunteer to spend some time at your local nursing home or senior citizen center. As clichéd as this may sound, you'd be surprised at how much fun you'll have. More so, senior citizens (many of whom do not leave their nursing home), can come to experience the outside world through you. Your time and attention is more valuable than you know.